At Holsworthy Community College our aim is to stimulate, challenge, encourage and support all of our students. Holsworthy Community College offers a wide range of extra activities and classes that challenge and motivate students, particularly the very able and talented. We also promote activities and courses el.sewhere. Design Technology, English, Maths and Science All offer a variety of enrichment activities such as the Aim Higher Peninsular Programmes at Plymouth Universities, Astroclasses in the Starlab Planetarium, ICT club, Science GCSE Revision Conferences, CLAIT qualifications, Maths Challenge, early entry English and Carnegie book shadowing. In Art, Music, Media and Drama students are producing professional standard pieces of work that are shown in school in the form of concerts, exhibitions and productions. Opportunities in the PE department include dance, trampolining, running for fitness. hockey , netball, rugby, cricket, football, athletics and many more. Our most able performers are entered for North Devon and/or County trials. JSLA qualifications, Born to Win competitions plus elite athlete courses at Budehaven and Torrington Sports colleges are all aimed to fulfil the potential of students. Local Geography and History visits enhance the curriculum. French and German exchanges and visits, Austrian and Swiss Skiing trips with qualifications all offer opportunities for Gifted and Talented students. The 14-19s department offers a range of opportunities and qualifications, within and outside of school hours, as additional GCSE level courses or level 3 (A level). These assist with access to further education and higher education. Aim Higher University awareness raising in Year 9 Careers and University taster day at Plymouth / Exeter University for subject areas. What does 'gifted' and 'talented' mean? 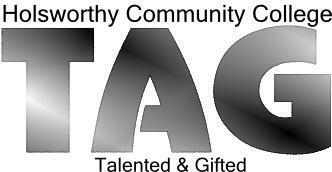 'Talented' - special ability in Art, Music, Drama, Physical Education and Dance or other subjects. What if my child is not part of the 15%? Registers are reviewed regularly as students develop at different rates. Staff are constantly assessing your child's skills and therefore the registers are constantly updated. How are children identified as gifted and/or talented? It is common for students who work hard to assume that they are Gifted and Talented. However, this is not necessarily the case. G&Twise is a new part of the TeacherNet website, designed to support all those involved In the education of the gifted and talented. it offers a searchable catalogue of G&T resources, produced by widely respected organisations in the field of education, such as London Gifted and Talented 0.44-0 and the National Association for Able Children in Education (NACE). Information on and interviews with authors, illustrators and poets plus book reviews, competitions and links to lots of other sites for keen readers. Website for the fantastic circa maths comics, which more able pupils really enjoy. An extremely comprehensive and informative website. Lots of interesting information for both students and teachers. Children can listen in on haddock calls, take part in quizzes and read up to date news on science and technology. There is information about events for teachers and INSET information. Very user friendly. An enormous database of explanations to satisfy even the most curious of pupils.